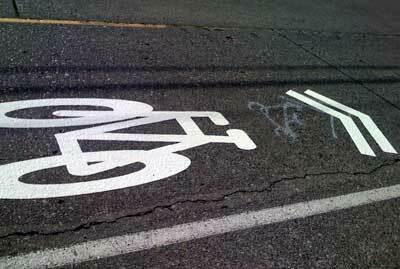 The sharrows on Beach Drive in Seattle were painted northbound, as I discovered on my ride yesterday. I rode 2 abreast with another cyclist along the sharrows and got buzzed by one car, another zoomed past, and one waiting until it was clear in the other lane to pass. Sharrows are wide enough for 2 abreast, but I wouldn’t do that necessarily in heavy traffic.